Windows 10 Enterprise is a smart choice for your business. It’s built to protect your business and its integrity using advanced security features. Windows 10 Enterprise introduces security enhancements like advanced biometrics, improved threat protection, and built-in malware protection for a safer, more secure environment. Whether you are cloud-based or on-site, Windows 10 Enterprise gives you superior data protection. Cyber security risks these days are more common than ever. You can’t afford not to have the best protection available.Windows 10 Enterprise’s advanced protocols stop malware from running on your devices. Enterprise Data Protection: Prevent accidental disclosure of sensitive information. Device Guard: Allows devices to be restricted to running only trusted software regardless of whether it is desktop software, Windows store apps, or in-house applications. Microsoft Passport: Allowing users to log into Windows 10 using biometrics (fingerprint, facial scan, PIN, or password). Sideloading: Sideloading lets Windows Store apps be installed on Windows machines. Mobile Device Management: Phones, tablets, and any running Windows 10 can be centrally managed by IT. Windows 10 machines can connect to a Mobile Device Management (MDM) server that will enroll and configure the devices and can apply updates and enforce the in-house policies governing usage. Azure Active Directory Features: Azure Active Directory (Azure AD) is Microsoft's multi-tenant, cloud-based directory and identity management service providing single sign-on access to thousands of SaaS applications like Office365, Salesforce.com, DropBox, and Concur. Microsoft integrates Azure AD with Windows to reduce the number of passwords users will need to remember. By linking Windows 10 devices to Azure AD, users can sign into Windows using their Azure AD account and password. The same devices can be automatically enrolled in a mobile device management service simultaneously. Granular UX Control: Lets your IT team customize and lock down the user interface of a Windows device to restrict the machine to a specific task. Enterprise Mode Internet Explorer: Older intranet sites often don’t render or behave as they should in newer browsers. To address this problem, Internet Explorer (IE) 11 introduces Enterprise mode that simulates an experience closer to IE8. This lets you disable newer browser features that could cause errors. There are tools for management and monitoring of compatibility. Device Encryption: Just like in Windows 8.1, if Device Encryption is enabled, all drives are automatically encrypted and can only be unlocked by someone with the user account's password. Device Encryption used BitLocker and 128-bit AES symmetric encryption. It supports a recovery mechanism where the recovery key is stored in Active Directory Domain Services. Group Policy Management: Windows 10 physical and virtual machines and devices can be managed using Group Policy settings. This lets IT configure user the computers in your company. If you want an OS designed for your business, Windows 10 Enterprise is the right choice. Advanced security, improved features and functionality, and a powerful way to manage do the things you need to do fo your company’s success. Get Windows 10 Enterprise. I had several questions regarding the product and install which were promptly answered by email. 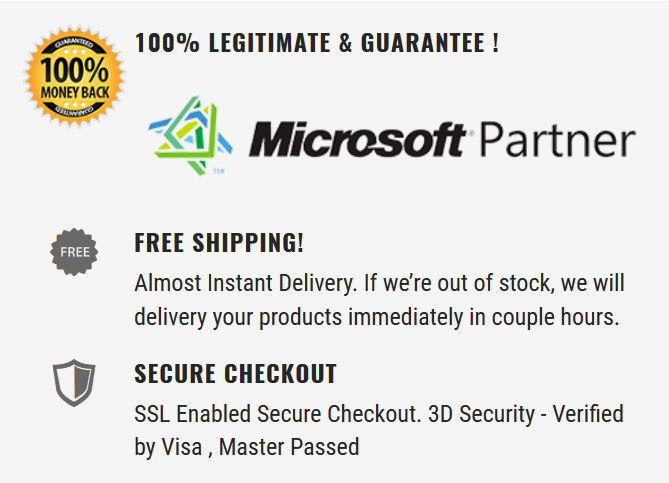 To be honest, I was reluctant to purchase this at first because I thought it was too good to be true, plus I've heard horror stories of the product codes being invalid. But I'm so glad I took the risk. It works perfect and I received the product key instantly!! I hope this website continues it's good success, and awesome products at amazing prices! !